Trimetazidine is a new anti-ischaemic drug that exerts cytoprotective effects without modifying coronary blood flow or systemic haemodynamics. We tested the antianginal efficacy of trimetazidine in combination with propranolol, using a double-blind isosorbide dinitrate-controlled design. Male patients (n = 53) with stable, effort-induced angina not sufficiently controlled with propranolol 40rng 3 times daily received at random either trimetazidine 20mg 3 times daily (n = 27) or isosorbide dinitrate 10mg 3 times daily (n = 26) for 2 months. From day 0 to day 60, in both groups, there was a decrease in the average number of anginal attacks per week (p < 0.01) and in the weekly consumption of nitroglycerin (p < 0.01), the latter being more decreased in the trimetazidine group (p < 0.05). On exercise testing, both exercise duration and time to 1 mm ST depression were improved in the trimetazidine group at day 60 compared with day 0 values (p < 0.001), while no significant changes were observed in the isosorbide dinitrate group. The total workload increased significantly more in the trimetazidine group than in the isosorbide dinitrate group for patients performing the exercise test on a bicycle (n = 31, p < 0.001), but not on a treadmill (n = 22, p = not significant). 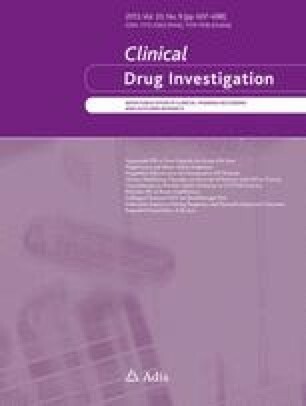 We concluded that in patients with stable induced angina not sufficiently controlled with propranolol, a better antianginal efficacy was observed with the addition of trimetazidine than with the addition of isosorbide dinitrate, and this confirmed the clinical interest in the new anti-ischaemic drug.